The June 30 vote by a Food and Drug Administration (FDA) advisory committee to lower the maximum dosage of over-the-counter drugs containing acetaminophen and eliminate prescription acetaminophen-combination painkillers raised questions about what changes consumers should expect in the availability of the popular drug. The commonly used pain- and fever-reliever known as Tylenol is found in several nonprescription cough and cold remedies, including NyQuil and Theraflu. Patients are also asking what potential dangers their daily use of acetaminophen may pose. TIME.com talked to members of the FDA committee as well as pain experts to sort through some of the questions. What exactly did the panel recommend? The FDA advisory panel, made up of scientists, doctors and consumer representatives, voted to make four major changes in the way acetaminophen is dispensed and packaged. First, it voted 21 to 6 in favor of lowering the maximum daily dose of nonprescription acetaminophen for adults, which is currently set at 4,000 mg; the panel did not specify a new maximum dosage. Second, the committee voted 24 to 13 to reduce the maximum single adult daily dose to 650 mg from the current maximum of 1,000 mg, or the equivalent of two tablets of Extra Strength Tylenol. Third, the members recommended 26 to 11 that the 1,000-mg over-the-counter dose be switched to a prescription-only status. Finally, the committee voted 20 to 17 in favor of "eliminating prescription acetaminophen combination products." In a separate vote, the panel recommended 36 to 1 that if acetaminophen-containing prescription drugs stay on the market, they should carry a black-box warning, the most serious safety label for prescription medications. The panel's recommendations were geared toward protecting consumers from potential liver damage due to unintentional overdose from the drug. According to the FDA, acetaminophen remains the leading cause of liver failure in the U.S., despite repeated government warnings. 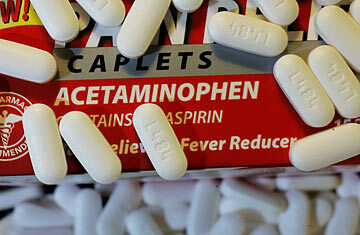 However, the majority of acetaminophen-related deaths are due to prescription drugs, not over-the-counter medications. FDA data indicate that overdoses of nonprescription cough and cold products, like NyQuil and Theraflu, occur infrequently, when patients combine these medications with other acetaminophen products, like Tylenol, and unknowingly increase their exposure to the drug. Did the panel recommend banning the painkillers Vicodin and Percocet? It's unclear. The wording of the question on which the members were asked to vote ("Do you recommend eliminating prescription acetaminophen combination products?") can be interpreted in two ways. A yes vote could indicate elimination of the product altogether, but it could also indicate elimination only of the pairing of acetaminophen and a narcotic (like hydrocodone or oxycodone), the other primary pain-relieving ingredient contained in Vicodin and Percocet. "The question did not specify, so conceivably panel members could have had different interpretations," says Ruth Day, director of the medical cognition laboratory at Duke University and one of the voting panel members. "However, there was a lot of other discussion about having just the main ingredient [e.g., hydrocodone] alone, so that's very likely the interpretation for everyone. And there was no call to remove the other ingredients  just take out the acetaminophen." Will I still be able to fill my prescription for Vicodin or Percocet? Yes. While the FDA usually follows the recommendations of its advisory panels, the recommendations are not binding. Even if they were, they would not take effect without careful consideration by the FDA of patients who currently rely on these medications for pain relief. "Any change would be carefully orchestrated to ensure that people are not at risk of not having access to their pain medication," says Dr. Judith Kramer, an internist at Duke University Medical Center and a voting member of the committee. Should I switch from Tylenol to aspirin or ibuprofen? Not necessarily. If you are not taking any other prescription pain medications that contain acetaminophen and you take Tylenol as directed, you should not be at risk of damaging your liver. Aspirin and other nonsteroidal anti-inflammatory drugs (NSAIDs) are effective pain relievers, but when taken at high doses and for prolonged periods  especially for the treatment of chronic pain in older adults  they carry a risk of stomach ulcers and gastrointestinal bleeding. NSAIDs may also raise blood pressure and affect kidney function. If you are concerned about your acetaminophen use, ask your doctor about which over-the-counter pain remedy is best for you. So I can still get Tylenol and other nonprescription acetaminophen products? Yes. Even if the FDA follows the committee's advice about over-the-counter acetaminophen products, they will still be available, only in lower doses. Is acetaminophen safe to take every day? Many people take Tylenol daily to relieve pain from chronic conditions such as arthritis, or they take Tylenol PM regularly to help them sleep. If taken as directed, doctors say these products are safe. At issue is the maximum daily dosage, which people may inadvertently exceed when taking a combination of medications that contain acetaminophen. Most people do not realize that the ingredient is present in so many different popular over-the-counter remedies. Why did the committee recommend eliminating acetaminophen-containing prescription drugs but not over-the-counter products? The members based their decision on the studies and data that were presented to them during the two-day meeting. The vast majority of studies linking liver failure to acetaminophen use involve prescription acetaminophen products, such as Vicodin or Percocet. More than 60% of the acetaminophen-associated liver problems occurred in patients using prescription medications, while only 10% occurred in those using nonprescription pain remedies. "The recommendations of the committee are based not on the logic of what we think is happening but on the data presented to the committee," says Kramer. "A much larger percent of liver-failure cases associated with acetaminophen involved a prescription acetaminophen product." Members were also concerned about the pairing of narcotic agents such as hydrocodone and oxycodone, both known to be addictive, with acetaminophen, which is known to increase the risk of liver problems with higher and higher doses. If patients become dependent on the narcotic and continue taking prescription painkillers, they are also more likely to suffer from liver toxicity associated with the acetaminophen. "How can you mix a highly addictive drug with one that can cause toxicity at high doses?" asks Dr. William Lee, director of the Clinical Center for Liver Diseases at the University of Texas Southwestern Medical Center. Lee presented data to the committee on liver damage due to acetaminophen overdose. "It's like putting poison in a candy." Read "6 Things to Know About the Acetaminophen Recall."